A Fit and Healthy Motherhood is yours..
You're just one click away from the essential best postnatal and beyond natal exercise videos, LIVE video classes at home, nourishing quick family-friendly recipes and lots of encouragement whether you're a new mother, have small children or older children. There's no gym, travel, parking or childcare to organise! You won't need hours in the kitchen and there are no diets either! 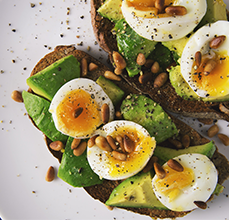 With short, incredibly effective routines and quick, easy recipes you'll save time, move well, be nourished and encouraged. You want to get fit again whether you recently had a baby or are a mother with either younger or older children but you just don't know where to start. You'd like to tone and tighten your tummy muscles but you don't know which exercises are safe and effective. You feel tired and lack energy to exercise or prepare and cook healthy meals. There is very little time for "you"; but you really want to exercise yet it feels so hard to fit into your busy schedule. There's a lack of specific, quality postnatal exercise advice with some of it being confusing. For mothers of newborns, toddlers and young children, here's what you get. Explore three "zones" in your own online membership area; move, nourish and encourage. Say "hello" to your tummy muscles, tone up and get fitter to have more energy to keep up with your little ones! (Choose from a variety of challenges depending on what you want to achieve; a flatter tummy, to heal a diastasis, to have leaner legs, to release tension, to tone up all over and more. Receive a calendar with a video and recipe behind each day. Streamed live to your home or catch the replays. A mix of toning and fitness classes, all just 30 minutes or less to fit into the busiest of days. Choose to target a specific part of your body or your whole body, with a selection of 10, 15 or 30 minutes exercise videos all with expert instruction. Get started quickly with 5 day kick start plans which target the mummy tummy or choose from a 30 day plan to tone up or the focused 8 or 12 week mummy tummy transformation plans. Each plan comes with exercise videos which are short and easy to fit into to a busy day; usually just 10 minutes a day. Love food and feel the benefits of nourishing your body for optimal energy and muscle tone. Without dieting or calorie counting! Jump start your healthy eating and make your life easier. from sticky chicken stir fry, mediterranean omelettes, green smoothies, coconut fluffy pancakes, chocolate beetroot cake. PLUS more! Vegetarian options too. Family friendly weekly meal plans and daily menus! Done for you and easy to follow with weekly shopping lists too. Personal encouragement from Vicky and the other like minded mothers so you feel inspired and stay on track. With bonus tips and videos you won't get elsewhere. For extra encouragement, with the 30 day challenges and tailored 8 and 12 week mummy tummy transformation plans you have the option of daily email reminders so you know which exercise video to follow on which day. 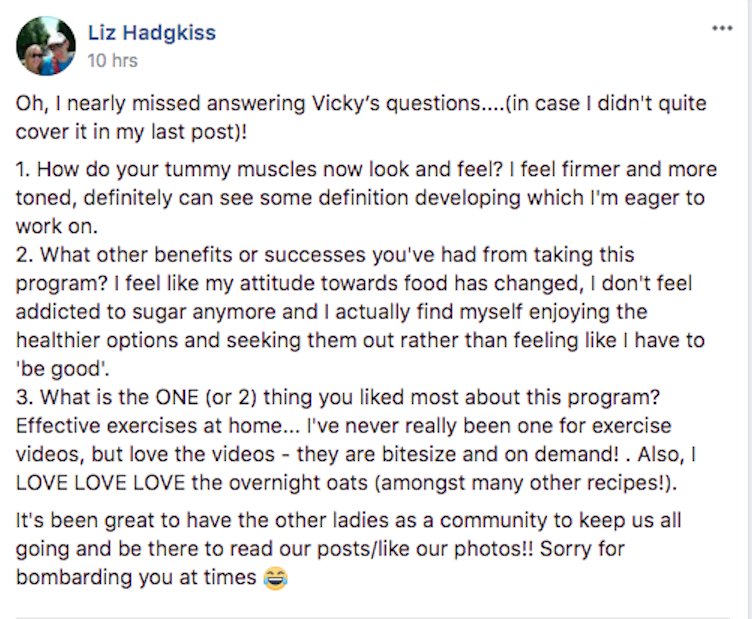 Have your questions answered with Vicky Warr. Healthy Eating Tips, Energy Tips and Lifestyle Tips. I got real strength in my tummy muscles; sitting up to get out of the bath is far easier as I realised it's because I'd used my tummy muscles again. Pregnancy and Postnatal Fitness Specialist and Creator of Bump and Beyond, the online fitness and health studio for a fit and healthy motherhood. 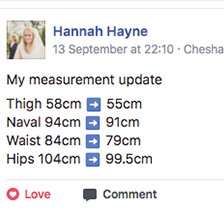 During my time as a personal trainer and qualifying as a pregnancy and postnatal fitness specialist, I found many women came to me to as previously they couldn't find specific quality exercise and nutrition advice that understood and took into consideration the changes to their body or the impact of pregnancy and birth. This meant some of these women lacked confidence to start exercising again after having a baby, didn't know what exercises to do and stalled to get started or even start. This had an impact on their recovery, strength and fitness as they entered their stage in life of motherhood. With my knowledge, experience and the incredible results I'd achieved with my clients, I know that a strong, fit, toned healthy body is totally achievable as you become a mother and as a mother. I'm here to share my method with you so you can have just that. The right kind of exercise that's safe for the changes to your body whilst still being effective. A quick, efficient plan that's realistic when juggling a family. Ways to eat healthily without spending hours in the kitchen and which are appealing to the whole of your family. Healthy, lifestyle habits which are easy to sustain. Here are the answers to some questions you may have. Just click the question to reveal a dropdown with the answer. Subscribing to one of the membership levels gives you unlimited access to all the content we have included in your chosen level for the recurring monthly price of that membership level. The number of exercise video classes, on demand videos, exercise and meal plans and recipes included in the subscription package may vary. From time to time, we may also add or remove videos or other content. To access the content within each membership, you just choose one of the membership subscription options above. Subscribing to either level means you have unlimited access to all videos, recipes and other content we have included in your chosen level for a recurring monthly price. The number of videos and recipes included in the subscription package may vary. We update content, add more videos and may remove some videos at any time. You’ll also get access to an amazing support network too which includes personal encouragement and your questions answered by Vicky Warr and inspiration and encouragement from other like-minded mothers. Vicky is in the exclusive group to accompany your membership daily, answering your questions and cheering you on! I already have a gym membership, what can this Online Fitness and Health Studio do for me? All the exercises in the videos and the exercise programs are designed and tailored specifically for women who went through the journey of pregnancy, birth, the early stages of motherhood and beyond. That means the exercises take into consideration the changes physically, emotionally and hormonally your body went through pregnancy and birth. The on demand videos are designed for you to do anywhere at anytime with an internet connection. You do not need a gym membership as you can do all the exercises at home. If you do want to retain your gym activity and find occasionally you don't have time to travel to the gym or attend a gym class then the live video classes in the Super Toned Up level and the on demand videos are a very convenient way to make sure you still fit in your exercise. Is all of the content available straight away or is it time released? Once you've signed up and paid for your membership, you will be able access all of the content for your membership level straight away with a username and password you choose when you sign up. We regularly update and add new exercise videos with the latest postnatal exercises and new exciting recipes plus there are bonus tips too to give you encouragement and provide variety for momentum. Can I upgrade to Super Toned later? 1. In your membership area, you'll see the option to upgrade within the 'Bonus' section. Just click this button and it's a quick process to upgrade. Once you've upgraded you'll get immediate access to the new content. 2. Get in touch by email to: support@bumpandbeyond.club and we’ll take into the account the time left on your current subscription, so you’ll never be charged double. How can I access the LIVE video classes? You'll just need to join our ‘Super Toned Up’ membership level which features the LIVE classes as the 'Fit and Fabulous' level doesn't. If you miss a live video class there are replays and also on demand videos too. To take a look at what you get besides the LIVE video classes, go here. Can I watch the videos on my ipad, mobile or mobile device? Absolutely! You are a busy mother so you can access the on demand videos, LIVE video classes, 30 day challenges, tailored plans and recipes from any device. Do I have to be online at a certain time to access the classes? The live video classes are held a set time on a certain day so all you need to do is turn up at the time of the class with the relevant link, which you will be sent if you have Super Toned Up membership. If you do miss the class, you have access to the recording afterwards, which you can then follow at anytime. All past class recordings are available in the membership area. How do I attend the Live Video Class? The live video classes are accessible if you have signed up to the level: Super Toned Up. Then log into the member’s area of www.bumpandbeyond.club using your username and password. Hover over “Live Video Class” in the menu and click on this option to be taken to the step-by-step instructions on how to register for and attend the live classes from wherever you are! Do I need any special equipment to follow the videos? Many videos do not require any equipment and others do require some hand weights, stretchy bands. There are a few videos where we recommend a foam roller to help with muscle tension and tightness. Vicky provides alternative household items if you don't have hand weights or stretchy bands. Can I get one on one help and support? If you have questions and are not a member please email Vicky at: info@bumpandbeyond.club or via her social media channels. If you are a member you'll get advice, encouragement and feedback any time from within our private facebook group. Vicky also hosts weekly live Q&A Thursday videos at a certain time and if you miss these you will always have the recording afterwards. You can pre-submit a question for Vicky at anytime via email to: info@bumpandbeyond.club or ask them in the private facebook community. I can’t remember by password. If you have forgotten your password simply click ‘login’ from the home page or main menu. You will be taken to the ‘login’ page, Click ‘forgot password’ link then follow the instructions. If there is anything you are not sure about; or anything that isn’t clear, please get in touch!